MASKerade: Muse 99 - Happy Birthday! Muse 99 - Happy Birthday! I focused on the basic layout and colours and changed the occasion. I used the PTI Phrase Play Happy die (cut down to a square) and sponged the 'red' background using Seedless Preserves and Ripe Persimmon. I used 3 gold enamel dots to capture the red dots and gold sequins from Vicki's original. There's still a couple of days to play along - the deadline is Monday morning at 8 am EST. Voting begins at that time and continues until Tuesday morning at 9. Voting results will be posted at noon on Tuesday. Hope to see you there! I LOVE this Ardyth! Spot on like... always! Love the pop of gold gems. That added depth you created with the sponging was a stellar move! Vicki's card - perfect, as always! Everytime I look at that muse gallery your card is one of the very first that draws my eye. Its no different this time. Love the inking and on closer inspection those gold dots are fab! Stunning birthday card Ardyth and I love all that red that you sponged, so so beautiful. Thanks to you I now have all the mini distress inks and they are neatly tucked away in the sweet metal tins with their own blending sponges stored under neath the inks...so much fun to be ready to go now. Thank you! 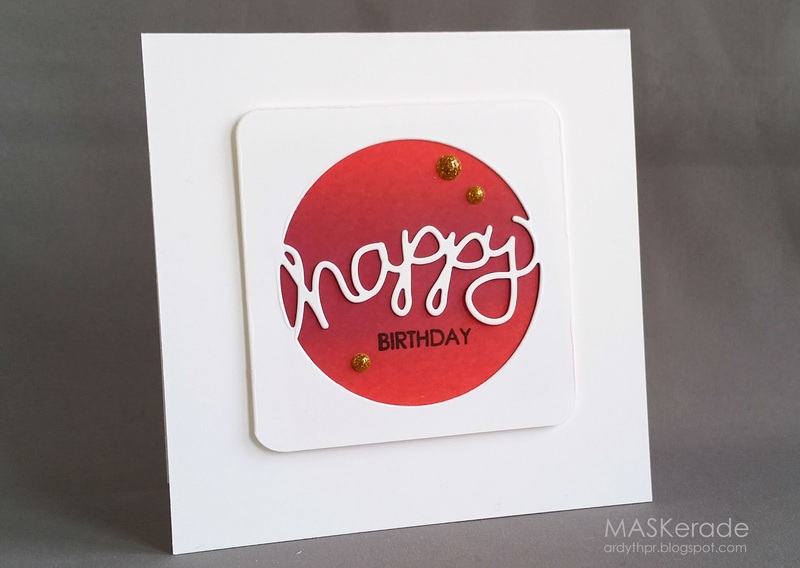 Your blending of the distress inks is awesome! Cool take on the inspiration. Wonderful take on the muse, Ardyth, and beautiful blending of inks. Stunning....I simply ADORE your wonderful creative style! Oh how I WISH my cards and MOJO flowed out like yours! You truly have such a gift...WOW! !